A fellowship is a type of graduate student financial support that is awarded to a graduate student to support them in their full-time course of study, without the obligation to teach or perform research. Fellowship funding from the University typically includes full tuition and stipend support, although the stipend levels vary depending on a student’s division and the prestige of the award. In addition, the term of funding varies by division. Fellowships may be provided from University general funds, departments, programs, or external sources such as governments or corporations. While the various types of fellowships are discussed below, external fellowships are discussed in a separate section. 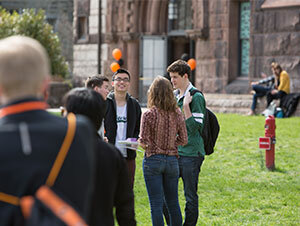 To allow students to devote themselves full time to graduate study in their first year of study, without the obligation to engage in teaching or research, Princeton University provides all of its first year Ph.D. students with fellowship funding. First year Ph.D. students in the Humanities and Social Sciences typically receive a University Fellowship, while first year Ph.D. students in the Natural Sciences and Engineering receive a First Year Fellowship. In addition to fellowships provided to all first year Ph.D. students, the Graduate School awards fellowships at the time of admission to select candidates based on merit. These fellowships include Centennial Fellowships, President’s Fellowships, and named fellowships awarded by the Graduate School. The Engineering departments also award the Wu and Upton Fellowships, which are awarded at the time of admission to select applicants based on merit. Specific programs also offer fellowship support to select students. These programs, which include the Latin American Studies Program, the Center for Human Values, and the Program in Hellenic Studies, select recipients based on their areas of study and their potential contribution to the program’s mission. Fellowship support from programs can include full tuition and support, or supplemental stipend support in addition to a student’s base funding.